The unforgettable Elizabeth Daniels Squire, a native of Raleigh, North Carolina, and a graduate of Vassar College, created the character of Peaches Dann, the absent-minded detective who is one of the most original crime solvers. 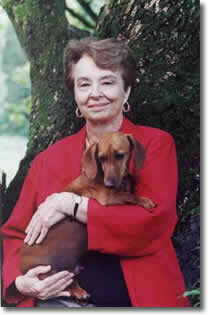 An Agatha Award winner, Elizabeth Daniels Squire, who died in 2001, was posthumously inducted into the North Carolina Literary Hall of Fame in 2006. A new edition of Elizabeth Daniels Squire’s first mystery novel, Kill the Messenger appeared under Five Star Publications’s Five-Star Sleuth’s imprint December 2008, followed in sequence by new Five-Star editions of all seven mysteries featuring Squire’s memorable but memory-challenged amateur detective, Peaches Dann. The last title in the series, Forget About Murder, in its new Five Star Sleuths edition, which will be out soon. A new Five Star edition of Fortune In Your Hand was revised and updated by her long-time editors (and late husband and youngest son), C. B. Squire and Worth Squire, based on notes left by the author. In addition to a complete how-to guide to hand-reading, this updated edition of Fortune In Your Hand includes a comprehensive history of plamistry from prehistoric Indian and Gypsy traditions to the modern era. It also shows readers how to take good hand-prints of their own for closer study. It contains all of the illustrations from the original edition, including the hand-prints of such celebrities as Salvador Dali, Carl Sandburg, Eleanor Roosevelt, and Helen Keller, as well as an annotated bibliography and an extensive index.